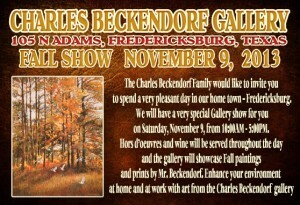 Fall is a spectacular time of the year at Charles Beckendorf Gallery in the Texas Hill Country. Take the scenic drive to Fredericksburg and visit our gallery and enjoy a day in our hometown. You’ll love the drive and you’ll love our cozy, quaint, little town filled with wineries, restaurants, and unique little shops, like our historic Texas gallery filled with amazing art by Texas artist Charles Beckendorf. Fall Show – Saturday, November 9th, enjoy a glass of wine, a cold beer, and hors d’ oeuvres while you choose your favorite piece of Beckendorf art! For details, call (830) 997-5955.